In stock -This product will ship today if ordered within the next 4 hours and 29 minutes. 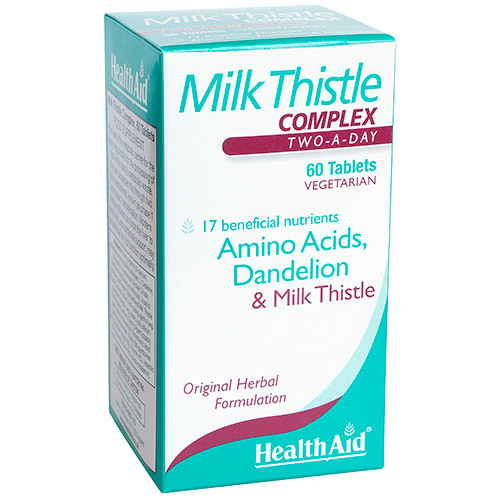 HealthAid Milk Thistle Complex is specially formulated using detoxifying herbs such as Milk Thistle, Dandelion, Turmeric and Artichoke and may help to support the liver. 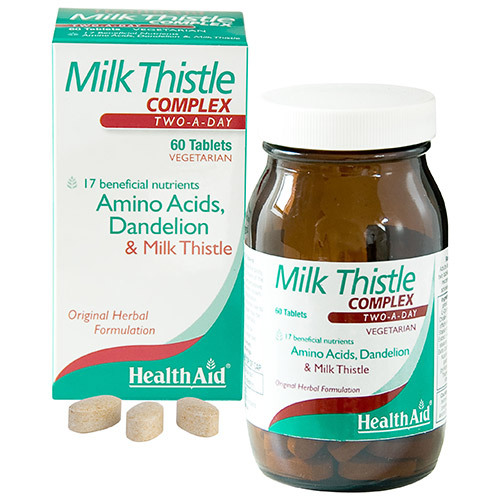 HealthAid`s philosophy has been to provide a range of products that are carefully researched and nutritionally balanced, and which help to supplement the many and varied dietary needs of the whole family. Many modern lifestyles involve an unhealthy dependence on highly refined or processed foods; hectic schedules, skipped meals, everyday stress and harmful environments which are detrimental to people’s health. HealthAid is committed to maintain an innovative and creative approach to its products, many of which reflect the latest research in the field of nutrition and health. Adults & Children (16+ years): Take 2 tablets daily. Do not exceed recommended daily intake unless advised by a suitably qualified person. Food Supplements should not be used as a substitute for a varied diet. 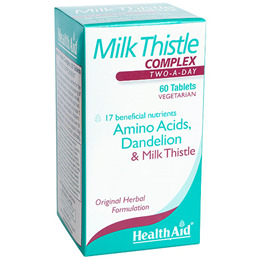 Below are reviews of HealthAid Milk Thistle Complex - 60 Tablets by bodykind customers. If you have tried this product we'd love to hear what you think so please leave a review.